Which U.S. State Flag Has A Union Jack On It? The Name Of The Most Popular Supercomputer Job Scheduler In The World Is A Nod To? Given the fundamental nature of the United States—that, to distill things down to their simplest form, was a country created through revolution against the crown of England—it’s a bit strange to find that there is a United States state flag that bears, of all things, the Union Jack. In fact, Hawaii is the only state that flies a flag with a foreign national flag upon it. 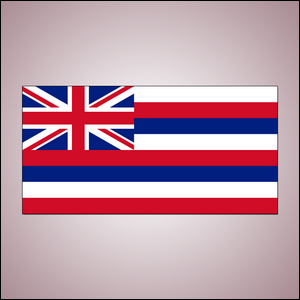 So how did the Hawaiian flag come to bear the Union Jack? While accounts are slightly varied, the general consensus is that the Hawaiian ruler King Kamehameha I flew a British flag (most likely the particular variation known as the Red Ensign) given to him by British explorer Captain George Vancouver as a token of friendship with King George III. Once the King flew the flag in places of honor, people began considering it the official Hawaiian flag. It’s been slightly redesigned over time, but the Union Jack has remained in the upper left corner all along. Image of the flag courtesy of the State of Hawaii.